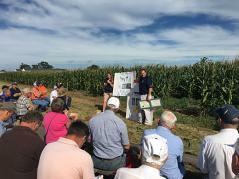 URBANA, Ill. – Agronomy Day – where science meets practice – returns to the University of Illinois for its 61st year on Aug. 16. As in previous years, Illinois producers will hear directly from U of I faculty on the latest scientific discoveries as well as practical advice on water quality, insect management, crop production, weed control, corn and soybean genetics, plant diseases, farm economics, agricultural engineering, and more. “Agronomy Day provides the opportunity for the latest information on profitable, sustainable, and environmentally sound strategies for producing food and protecting natural resources,” says Bob Dunker, agronomist and former superintendent of the Crop Sciences Research and Education Center and chairperson for Agronomy Day. Agronomy Day will be held at the South First Street Facility, located at 4202 South 1st Street in Savoy; directions appear on the updated Agronomy Day website. Based on feedback from previous years, attendees will experience a new tour layout. This year, “tours” will be held in multiple tents surrounding the main exhibitors’ tent, each with a unique sequence of speakers. Presenters will be grouped according to themes for which attendees can earn certified crop advisor (CCA) credits. This year’s keynote speaker is Chris Harbourt: engineer, entrepreneur, and leader with over 20 years of experience in agriculture, technology, business and academia. Harbourt, who co-founded Agrible and currently is a managing partner with Hatch Ag Group and an adjunct professor in the College of Agricultural, Consumer and Environmental Sciences, will share his vision of the future of crop production and agronomic services. The exhibitors’ tent will feature exhibits by sponsors, commercial vendors, research posters, ACES programs, and student clubs. Lunch, provided by Nelson’s Catering, will be available for $8. More information and registration can be found at http://agronomyday.cropsci.illinois.edu/ or by contacting Sue Overmyer at 217-300-3702 or overmyer@illinois.edu.